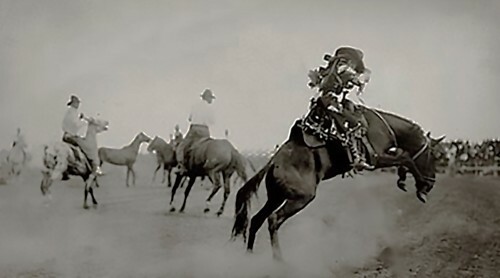 Women have long participated in the rodeo. “Prairie Rose” Henderson debuted at the Cheyenne Frontier Days rodeo in 1901, and by 1920, women were competing in rough stock events, relay races and trick riding. However, after two serious rodeo accidents involving women, the newly created Rodeo Association of America (R.A.A.) became opposed to female involvement in rodeo. Eventually, women organized into various independent associations and staged their own rodeos. Today, women’s barrel racing is included as a competitive event in professional rodeo, with breakaway roping and goat tying added at the collegiate and lower levels. Women compete equally with men in team roping, in traditional roping and in rough stock events at women-only rodeos. Learn more about women in rodeo and great rodeo you can enjoy!